8" + 1" horn active 200w plastic speaker cabinet. 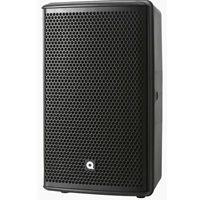 The Quest QSA 200i is a tremendously versatile powered PA package - for small band fold-back or PA, audio visual presentation, high SPL compact audio monitor, mid power distributed systems, where ever you need compact portable or fixed full bandwidth audio. The high sonic output and small size of the Quest QSA 200i is a result of the sophisticated Quest analogue engine electronics and purpose designed, heavy-duty Quest speaker components. Multiple inputs, wave-guide HF horn that can be rotated from vertical to horizontal dispersion planes and fan cooled 2-way amplifiers make the Quest QSA 200i a flexible and reliable choice for both live mobile audio and permanent fixes installation environments.